Toward this type of review, we provide the table below. It's similar to that published by Makinen (2000) in his paper "The Rocky Road of Xylitol to its Clinical Application." This paper documented the tribulations of dental health professionals over the years as they promoted the use of xylitol. It also detailed various dosing amounts that had been evaulated and the reduction in tooth decay rates that had been attributed to them. a) Beyond a certain point, more isn't better. The table above shows that most studies (including those that reported the greatest anti-cavity effect) only dosed their subjects with moderate amounts of xylitol, typically on the order of 10 grams per day or less. The existence of a dosing ceiling was confirmed by a study [Milgrom (2006)] that evaluated different xylitol doses in regard to their ability to create changes in the level of cariogenic bacteria (the types of bacteria that cause cavities) found in dental plaque and saliva. Its conclusions were that a plateau effect came into play where amounts exceeding 10.3 grams per day were not likely to increase effectiveness. Most adults only need about this much (2 tsp.) per day. This study also concluded that doses of 3.5 grams or less per day were ineffective in producing changes in populations of these bacteria. !! Overall, it suggested that an effective xylitol dosing for preventing tooth decay lay between 6.9 and 10.3 grams per day. That's on the order of about 2 tsp. per day (see picture). b) Long-term consumption is well tolerated. Take notice that each study listed above ran for at least one year and, at the other extreme, for as long as 3.3 years. This shows that the long-term consumption of xylitol (within the levels shown in the table) is easily tolerated and does not pose a health risk or create significant side effects. c) Protection takes time to develop. The time frames chosen for the above studies reflects the fact that the preventive effects created by xylitol consumption are not immediate. A person's regimen needs to be in place and continued for several consecutive months, and preferably a year, before it can be assumed that maximum anti-cavity protection exists. Conclusions: Xylitol dosing for adults. Based on the findings of the studies listed in the table above, for an adult, the following regimen would seem to be reasonable and expected to ultimately produce an optimal anti-cavity effect. 1) Six to ten grams per day. 2) Divided up into three to five doses throughout the day. 3) Continuation of this regimen for six months to a year before it can be assumed that maximum anti-cavity protection exists. Hello, Do I need to ingest the xylitol to help prevent cavities, or can I rinse my mouth out with a mixture of xylitol & water? Thank you. Thanks for asking and we'll go through our site and try to make this point more clear for others. 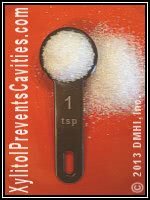 In regard to cavity prevention, it's the amount of xylitol that your mouth is exposed to that's important. Any xylitol that is swallowed does not further contribute to this effect. That means (just like you suggest) rinsing with a xylitol solution (and spitting it out) can be an effective way to create the needed amount of oral exposure. You would need to do this a couple of times a day. By not swallowing, you avoid the potential for possible gastric upset. What ratio should a mouthwash contain of xylitol to water? I've been making a 1:1 ratio mouthwash by melting the sugar into water over low heat and use that 4 times a day as a mouthwash. Is this too concentrated? It's the dosing level that's important, not the concentration. Even just placing granular xylitol directly into your mouth (which in effect is an even more concentrated form), letting is dissolve in your saliva and then swishing with that would be just fine. But what your question doesn't address/explain is your total exposure to xylitol per day (both per dosing and total daily dosing). That's what's important. This page discusses making homemade rinses.